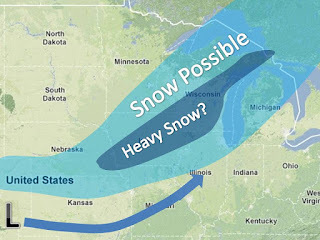 A major winter storm will strike the Midwest Wednesday night into Thursday. It will likely lead to blizzard warnings in some areas. The models do still have some differences in the track of the system. The map in the left show the MOST LIKELY scenario and should be used a a reference. With that said, someone will get over a foot of snow and the dark blue will possibly see 6-12" if the track holds. With the mild winter last year, this will likely shape up as the largest winter storm in almost 2 years. You are going to want to stay tuned for updates throughout the week!